Well these are decidedly NOT vegan and definitely NOT healthy. 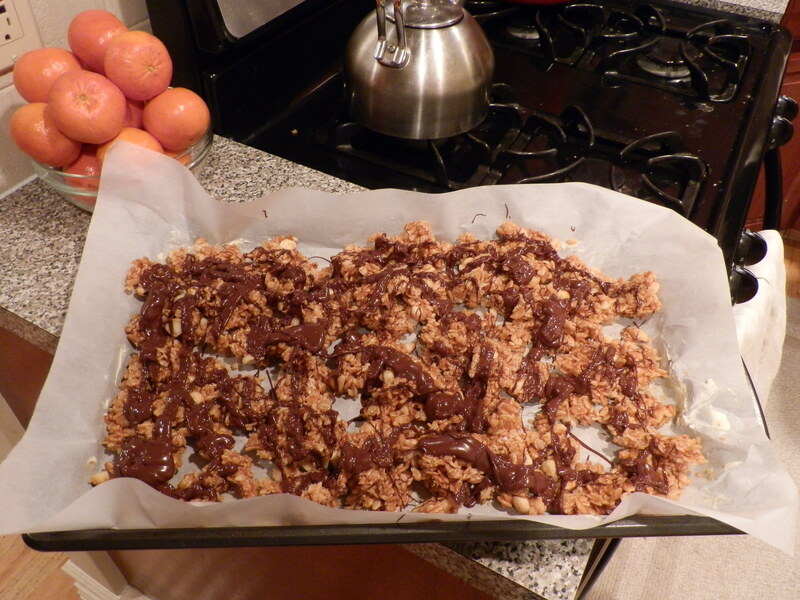 But, they are oh so delicious and the husband was craving some Rice Krispie treats. He so rarely asks for anything specific that I feel when he does, the request should be honored. That’s a little bit of a lie. He actually asked for “Rice Krispie treats with m&ms” and I thought…. “hm, can I make those a little fancier?”. The answer is yes, yes I can. And I can include Macadamia nuts because, let’s face it, they’re the most delicious little things on earth. Crunchy, tropical, buttery. Yum! So, I scoured the internet and found this Todd English gem for fancy Rice Krispie treats. And maybe this time Iain didn’t ask for these specifically, but judging by how many he ate, I think next time he will. * I could only find raw Macadmia nuts. So, these were quickly “roasted” in a frying pan with a little cooking spray and a sprinkle of salt. Just heat until toasty-brown. Butter 17- by 12-inch rimmed baking sheet. Line with parchment paper, leaving 1-inch overhang on each end, and butter paper. In large heatproof steel bowl, toss together cereal and nuts. In heavy large saucepan over moderate heat, stir together sugar and 6 tablespoons water. Cook, stirring occasionally, until sugar dissolves, then raise heat to moderately high and boil without stirring, occasionally brushing down sides of pan with wet pastry brush, until syrup turns deep amber in color, about 8 minutes. Carefully stir in cream (mixture may splatter and briefly harden) then stir in butter. Remove from heat and stir in salt and vanilla. Drizzle caramel over cereal-nut mixture and, using heatproof silicone spatula or wooden spoon, stir until fully incorporated. Spread mixture evenly on prepared baking sheet. Refrigerate until firm and slightly cooled, about 10 minutes, then break into bite-sized pieces. In small metal bowl set over saucepan of barely simmering water, combine chocolate and oil. Heat, whisking occasionally, until melted and smooth, about 5 minutes. 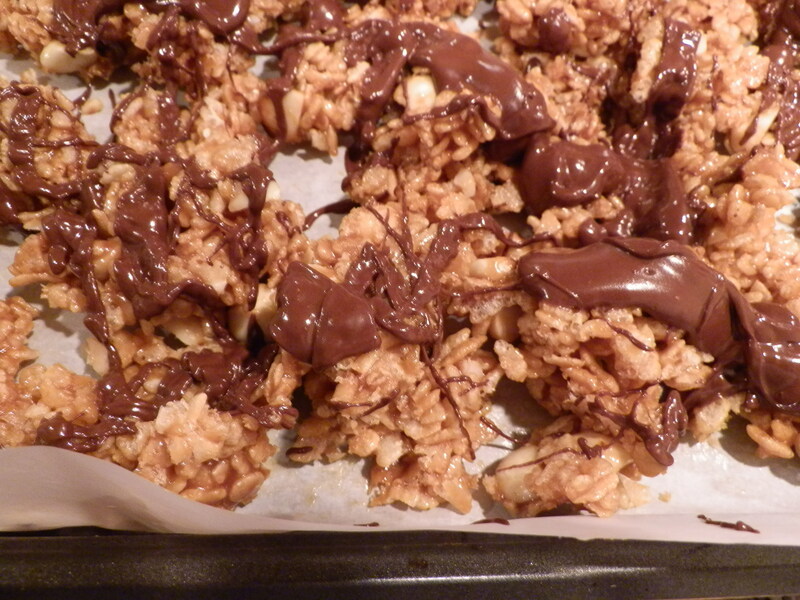 Drizzle chocolate mixture over Rice Krispie pieces and let stand until chocolate hardens. Rice Krispies Treats will keep in an airtight container for up to two days.